The Holy Spirit wants to be pursued and will not be pushed. This is just another way of saying that if we want to see and experience the full range of spiritual gifts we must relentlessly seek them. Is this idea of pursuing the gifts biblical? It certainly is! We see this encouragement to pursue the gifts, ask God for them, and pray for them in two passages in 1 Corinthians. These verses tell us that it is not only permissible to seek the spiritual gifts — it is mandatory. The first passage we’ll consider is 1 Corinthians 14:1. Pursue love, says Paul, and earnestly desire the spiritual gifts, especially that you may prophesy. This text says nothing about prayer, so how can I suggest that we should ask God and pray for more spiritual gifts than we already have? The answer is found by putting this passage from chapter 14 together with an earlier passage in chapter 12.
all these [that is, all the spiritual gifts he has just enumerated in 1 Corinthians 12:8-10] are empowered by one and the same Spirit, who apportions to each one individually as He wills. This means that the Holy Spirit is the one who decides who gets what. We don’t. But we are told to “earnestly desire” spiritual gifts. Isn’t it reasonable to think that if we are responsible for desiring spiritual gifts and the Spirit is responsible for distributing them, we should ask that He fulfill our desire by granting us the gifts we want to see manifest in our lives? I would suggest that the “desire” we feel for certain gifts is likely itself the fruit of the Spirit’s work in our hearts. He desires (or wills) to grant us a gift (or gifts), which awakens in us a desire for the very thing He is determined to impart. Don’t forget that Paul issues this exhortation in 1 Corinthians 14:1 to Christians. These are men and women who have already been born again and already possess at least one spiritual gift. 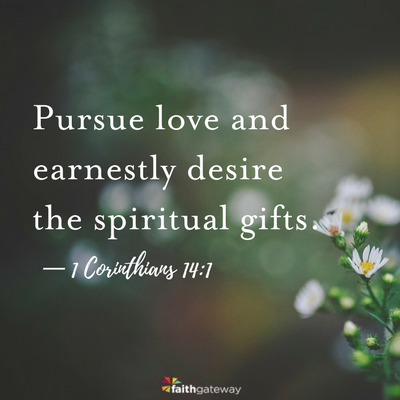 Paul is exhorting believers, in whom the Spirit already permanently dwells and to whom the Spirit has already granted at least one gift, to “earnestly desire” yet more gifts. This indicates that we have a responsibility to pursue their presence in our lives. And how do we do this? By asking God for their impartation. Paul is speaking about a believer who already has the spiritual gift of speaking in tongues, and he tells her to ask God for the spiritual gift of interpretation of tongues. Why? Paul wants everything that occurs in the corporate assembly of God’s people to be intelligible. If there is no interpretation of tongues, what is said in tongues is of no value to others present. This is a key principle for exercising the gifts. If you are going to exercise your gift of speaking in tongues in a setting whose purpose is the edification or building up of other Christians, either make certain that someone with the gift of interpretation is present (see 1 Corinthians 14:27-28) or pray that God would grant you yourself the ability to interpret your own tongue. Timothy was a born-again Christian when the elders prayed for him, and it was at that time, subsequent to his conversion, that the Spirit imparted a spiritual gift by means of a prophetic word spoken by one of those ministering to him. The word translated as “gift” in this text is charismatos, from the noun charisma, and it is sometimes translated with the word spiritual added to it (“spiritual gift”) throughout 1 Corinthians 12-14. Heavenly Father, we thank You for Your gracious work of salvation in _________. We rejoice in knowing that Your precious Holy Spirit now abides permanently in Your child. Lord, we also know that You alone can empower Your children for ministry. __________ has experienced an increasing desire for the gift of giving (or tongues, or prophecy, or serving, etc.). We hope that this desire is the work of the Spirit in his/her heart. So we ask now that You would graciously impart this gift to him/her. Grant him/her immediate opportunities to exercise this gift for the building up of others and the praise and honor of Jesus. And Lord we also ask that You would be pleased to confirm the presence of this gift through some prophetic revelation, whether by word of knowledge or dream or vision. Excerpted with permission from Practicing the Power: Welcoming the Gifts of the Holy Spirit in Your Life by Sam Storms, copyright Sam Storms.